I started doing woodwork in high school when a neighbor, Ted, allowed me to use his garage woodshop. During that stage of my woodworking development, I was self-taught. Looking back at my time in Ted’s garage, I feel very fortunate that I never suffered a serious accident. I continued to develop my woodworking experiences during my under graduate work at the University of California at Santa Barbara. After graduating from UCSB with a social science degree I spent a year on Maui helping some friends build a house and became hooked on woodworking. I enrolled at Humboldt State University to pursue a teaching degree and second BA in industrial arts with the goal of becoming a high school woodworking teacher. The education that I received at Humboldt State provided me with the technical framework to mature as a woodworker and teacher. 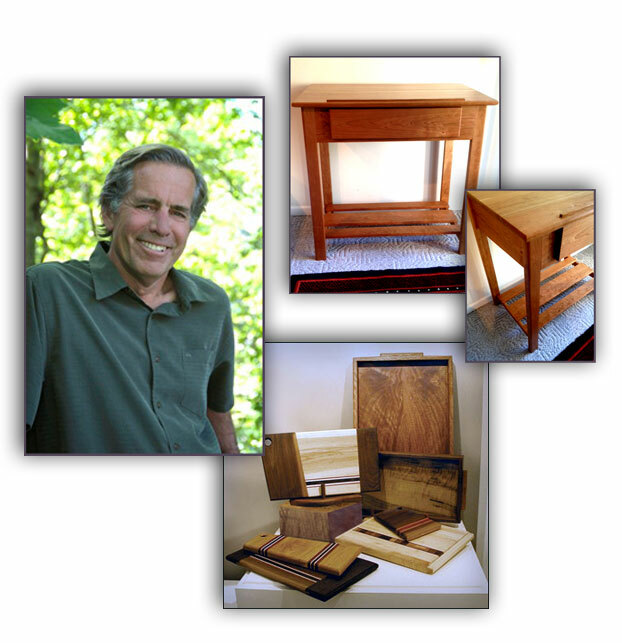 During my thirty-seven years of teaching high school woodworking, I have taught in Australia, California, Eagle Point, and the last twenty-eight years at Ashland High School. Teaching at Ashland High School has been my dream job – I get to teach my passion for woodworking to wonderful students, and I get to live in a very supportive community. I became member of Ashland Art Works in 2010. Becoming a part of a cooperative of artists has inspired me to stretch my woodworking and to combine form with function. My work is intended to provide generations of use and enjoyment. Mortise and tenon joinery, mitred splines, dowels, dovetails. and floating tenons are a few of my favorite construction techniques. My work consistently attempts to highlight the natural beauty found in selected pieces of lumber. I collect unique pieces of lumber and find enjoyment in sharing their beauty with others. When I use exotic woods, I try to purchase certified lumber that is harvested from tree farms. My greatest satisfaction comes from using woods native to Oregon. My development as a woodworker continues to improve, and I am excited about learning more. While I enjoy being a member of Ashland Art Works, I also enjoy designing that special piece for clients on an individual or personal level. I am available to do commission work.